Many investors in emerging market (EM) stocks believe they made a bad allocation in the past couple of months, and some investors have sold their stakes in disgust. EM stocks, measured by the MSCI Emerging Markets Index, posted a strong gain of 37% in 2017, encouraging investors to look at this asset class as we entered 2018. After a strong January, EM stocks pulled back with the rest of the global stock market and are now down about 15% from their late-January highs. Despite this, WT Wealth Management believes it may be wrong to count EM stocks out of your portfolio. Depending on a variety of personal factors, an allocation to EM is still appropriate for many investors. We wouldn't be looking to sell or pare back current holdings. History has shown that the mid - or even late - stage of the economic cycle just may be when emerging markets shine. EM stocks have shifted from taking the lead to coming up from behind in investors' opinions. Investors fear a regression to an economic environment that thwarted EM stocks before. The present economic environment may resemble those that had spurred EM stock out-performance. Past periods of EM stock struggle included the 1994 Mexican peso crisis, the 1997 Asian financial crisis, and the 2013 Taper Tantrum. In each of these, the Federal Reserve took action to tighten monetary policy, going so far as to taper back $70 million in bonds and mortgage-backed securities in the case of the Taper Tantrum, which contributed to the MSCI Emerging Markets Index's 150.5% plunge a year later. Usually these types of Fed action signify the exit from a recovery period or early economic cycle and entry into mid-cycle economic recovery. Yet these mid-cycle changes in monetary policy did not invert the U.S. Treasury yield curve, nor did a global or U.S. recession follow them. However, they did boost the broad trade-weighted value of the dollar by about 20%, which weighed on EM stocks due to the dependence of EM stocks on dollar-based financing. Therefore, EM stocks suffered during each of these mid-cycle periods, under performing their developed market peers, as this chart shows. The MSCI USA Index is designed to measure the performance of the large and midcap segments of the US market across 631 stocks. The index covers approximately 85% of the market capitalization in the US. The MSCI EAFE Index, an equity index representing developed-market countries, includes stocks from: Australia, Austria, Belgium, Denmark, Finland, France, Germany, Hong Kong, Ireland, Israel, Italy, Japan, the Netherlands, New Zealand, Norway, Portugal, Singapore, Spain, Sweden, Switzerland, and the UK. The MSCI Emerging Markets Index, comprising 23 emerging economies worldwide, includes stocks from: Brazil, Chile, China, Colombia, Czech Republic, Egypt, Greece, Hungary, India, Indonesia, Korea, Malaysia, Mexico, Peru, Philippines, Poland, Qatar, Russia, South Africa, Taiwan, Thailand, Turkey, and the United Arab Emirates. 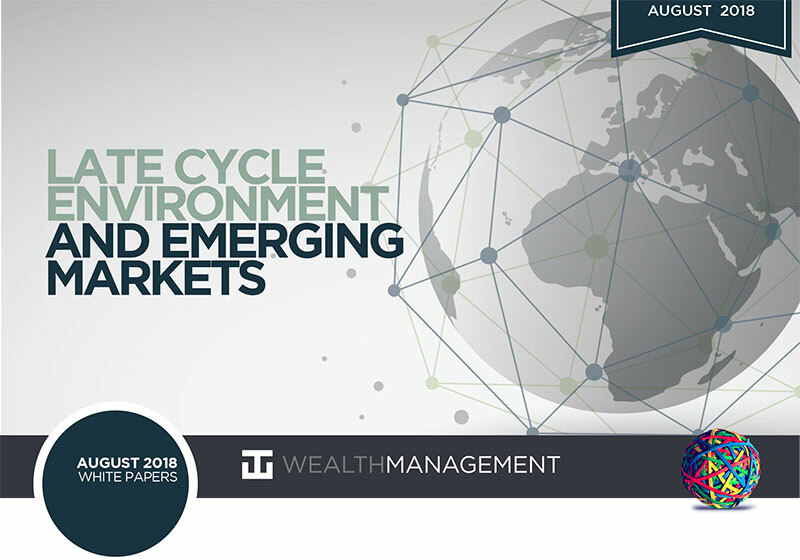 WT Wealth Management views the current economic environment as late-cycle, which has historically favored EM stocks. The Fed took initial action to end quantitative easing and raise interest rates with its first rate increase in December 2015. This move started the flattening of the yield curve, thus sparking the discussion that this economic cycle is past its midpoint and into its later stages. Typically, the US dollar is relatively stable at late cycle, which is good for EM stocks. This stability in the dollar has, at least in part, led EM stocks to outperform during late-cycle environments in the past as shown in the chart below. EM stocks outperformed in two of the three periods covered in the chart above. EM stocks outperformed in spite of pressure put on them in some perpetually susceptible nations. At WT Wealth Management, our experience, discipline and long-term investment focus drive us to evaluate asset classes that are temporarily out of favor with investors. While EM stocks may have lost leverage during the past quarter, our view that the markets are in a late-cycle environment gives us reason to see opportunity in EMs after the recent sell-off. Keep in mind that adding an asset class like emerging market stocks to your portfolio is based on your personal risk tolerance, your investing time horizon, the strategy you are currently invested in, and a variety of other personalized factors. Please contact your investment advisor professional if you have any questions or would like to discuss the opportunities within EM stocks in greater detail. Fuscaldo, Donna. "Charles Schwab: Don't Count Out Emerging Market Stocks." Investopedia, June 14, 2018. Kleintop, Jeffrey. "Emerging Market Stocks: From Front-Runner to Dark Horse?" Charles Schwab, June 11, 2018. Morgan Stanley Capital International. MSCI EAFE Index (USD). New York: MSCI Inc., 2018. Morgan Stanley Capital International. MSCI Emerging Markets Index (USD). New York: MSCI Inc., 2018. Rapoza, Kenneth. "Happy Anniversary to Market's Taper Tantrum." Forbes, May 23, 2014. Silver, Caleb. "MSCI Emerging Markets Index." Investopedia, 2018. WT Wealth Management is an SEC registered investment adviser, with in excess of $100 million in assets under management (AUM) with offices in Flagstaff, Scottsdale and Sedona, AZ along with Jackson Hole, WY and Las Vegas, NV. WT Wealth Management is a manager of Separately Managed Accounts (SMAs). With SMAs, performance can vary widely from investor to investor as each portfolio is individually constructed and managed. Asset allocation weightings are determined based on a wide array of economic and market conditions the day the funds are invested. In an SMA, each investor may own individual Exchange Traded Funds (ETFs), individual equities or mutual funds. As the manager we have the freedom and flexibility to tailor the portfolio to address an individual investor's personal risk tolerance and investment objectives - thus making the account "separate" and distinct from all others we manage. An investment with WT Wealth Management is not insured or guaranteed by the Federal Deposit Insurance Corporation (FDIC) or any other government agency. Any opinions expressed are the opinions of WT Wealth Management and its associates only. Information offered is neither an offer to buy or sell securities nor should it be interpreted as personal financial advice. Always seek out the advice of a qualified investment professional before deciding to invest. Investing in stocks, bonds, mutual funds and ETFs carries certain specific risks and part or all of an account's value can be lost. In addition to the normal risks associated with investing, narrowly focused investments, investments in smaller companies, sector and/or thematic ETFs and investments in single countries typically exhibit higher volatility. International, Emerging Market and Frontier Market ETFs, mutual funds and individual securities may involve risk of capital loss from unfavorable fluctuations in currency values, from differences in generally accepted accounting principles or from economic or political instability that other nations experience. Individual bonds, bond mutual funds and bond ETFs will typically decrease in value as interest rates rise. A portion of a municipal bond fund's income may be subject to federal or state income taxes or the alternative minimum tax. Capital gains (short and long-term), if any, are subject to capital gains tax. Diversification and asset allocation may not protect against market risk or investment losses. At WT Wealth Management, we strongly suggest having a personal financial plan in place before making any investment decisions including understanding personal risk tolerance, having clearly outlined investment objectives and a clearly defined investment time horizon. WT Wealth Management may only transact business in those states in which it is registered, or qualifies for an exemption or exclusion from registration requirements. Individualized responses to persons that involve either the effecting of transactions in securities, or the rendering of personalized investment advice for compensation, will not be made without registration or exemption. WT Wealth Management's website is limited to the dissemination of general information pertaining to its advisory services, together with access to additional investment-related information, publications, and links. Accordingly, the publication of WT Wealth Management's website should not be construed by any consumer and/or prospective client as WT Wealth Management's solicitation to effect, or attempt to effect transactions in securities, or the rendering of personalized investment advice for compensation, over the internet. Any subsequent, direct communication by WT Wealth Management with a prospective client shall be conducted by a representative that is either registered or qualifies for an exemption or exclusion from registration in the state where the prospective client resides. A copy of WT Wealth Management's current written disclosure statement discussing WT Wealth Management's registrations, business operations, services, and fees is available at the SEC's investment adviser public information website (www. adviserinfo.sec.gov) or from WT Wealth Management directly. WT Wealth Management does not make any representations or warranties as to the accuracy, timeliness, suitability, completeness, or relevance of any information prepared by any unaffiliated third party, whether linked to WT Wealth Management's web site or incorporated therein, and takes no responsibility therefor. All such information is provided solely for convenience purposes and all users thereof should be guided accordingly.